With the March 20 passage in the NH House of Representatives of a resolution calling for a policy of no-first-use of nuclear weapons and opposing development of so-called “low yield” nuclear weapons, New Hampshire legislators added their voices to a growing movement aimed at reducing the risk of nuclear conflict and moving the world toward abolition of nuclear weapons. 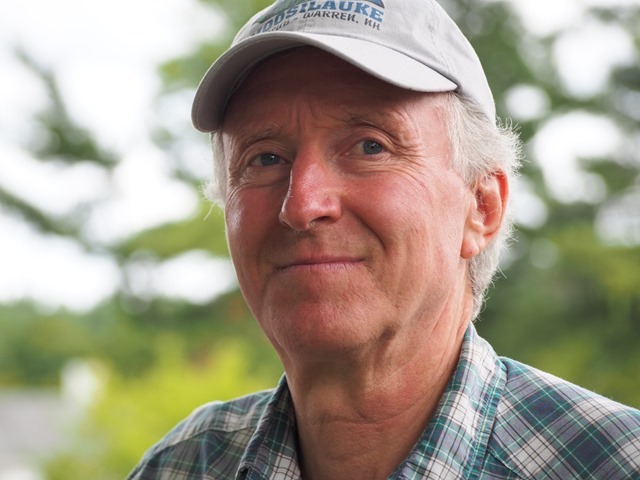 Other measures, based on a resolution known as “Back from the Brink,” also cleared the City Council in Portsmouth last Monday and Town Meetings last week in Warner, Alstead, Lee, and Exeter. The Durham Town Council passed one in December. New London’s Town Meeting kicked off the latest round two years ago. 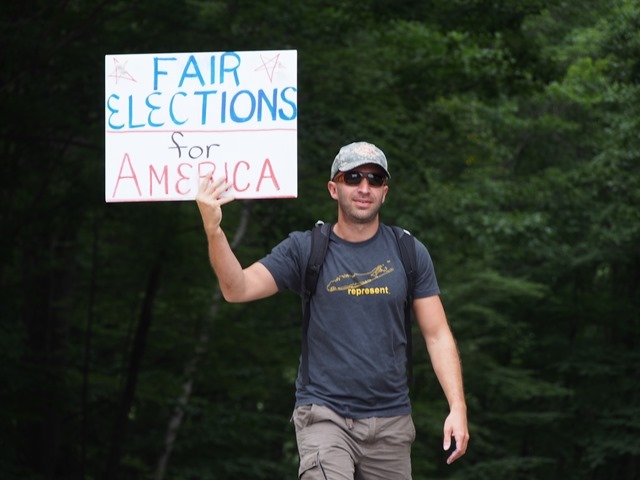 The resolutions flow from an organized effort by groups including NH Peace Action, the American Friends Service Committee, Seacoast Peace Response, Rights and Democracy, and the Union of Concerned Scientists to spotlight concerns about nuclear weapons at a time when presidential candidates are flocking to New Hampshire. The candidates are also starting to get questions on the campaign trail. The reason should be obvious: 75 years into the atomic age and 3 decades after the Cold War ended, the world is still threatened by the possibility that through escalation of international conflict, accident, or technological malfunction, nuclear weapons could be exploded. Consider, for example, the festering tensions along the border between India and Pakistan, two of the world’s nine nuclear-armed powers, that could spin out of control. “A large‐scale nuclear war could kill hundreds of millions of people directly and cause unimaginable environmental damage, producing conditions wherein billions of people could die from starvation or disease,” the resolution added. Yet, the United States and other nuclear powers are pursuing new nuclear weapons, even ones designed for battlefield use, rather than diplomatic courses to de-escalate tensions and reduce the chance that nuclear weapons would ever be used. The decisions by US and Russian leaders to pull out of the Intermediate Nuclear Forces agreement and possibility that the New START treaty might go unrenewed in 2020 stand as stark examples. For our country, this is a dangerous change of course from the approaches of previous presidential administrations, Republican and Democratic, which even at the height of the Cold War knew that restraint was preferable to an uncontrolled nuclear arms race. According to a recent poll conducted by the Union of Concerned Scientists, 84 percent of New Hampshire residents think it is very (54 percent) or somewhat (30 percent) important for candidates in the upcoming 2020 presidential election to lay out their views regarding nuclear weapons. Voters will welcome the responses. News that President Barack Obama is considering a trip to Hiroshima brought back memories of meeting him on his first trip to Concord, early in his presidential campaign. Given a heads-up that the Illinois Senator was headed for the Eagle Square Deli, colleagues and I went there in time to order lunch, find a table, and wait for his still small entourage. Obama worked the room, escorted by Ann McLane Kuster, then a local attorney, now our Representative in Congress. When he reached our table I asked the Senator a critical question about “free trade” agreements, but that’s a story for another day. As Kuster was trying to get him to the next table, Erin Placey, my 24-year old colleague, grabbed Obama’s hand for a shake. Once she had his attention, Erin said she wanted to know if Obama would pursue the abolition of nuclear weapons should he become president. Obama responded quickly that he had dedicated considerable attention to halting nuclear proliferation, but Erin was not satisfied. The former law professor was a bit taken aback by Erin’s directness and the specificity of her statement. He let on that he needed to look into it more deeply. Look into it he did. Five days later, Erin Placey saw Obama again at an apple orchard campaign stop in Londonderry, New Hampshire. By then, she had been to Hiroshima and Nagasaki as a delegate to the World Conference on Atomic and Hydrogen Bombs. There, she met peace activists from all over the world, including several “Hibakusha,” as the survivors of the atomic blasts are known in Japan. The Hibakusha, dwindling in numbers as the years pass, are the moral leaders of a movement that demands nuclear weapons must never be used again and must be abolished. For Erin, who grew up in southern Maine with family members employed at the local nuclear submarine base, the trip had a profound effect. But instead of continuing on the path toward “a world without nuclear weapons,” his administration is now backing a trillion dollar plan for an entirely new generation of nuclear warheads, along with new bombers, submarines, and missiles that could deliver them to targets across the globe. “When Obama stopped pushing his nuclear policies in 2011 (save for Iran), the nuclear-industrial complex took over,” Joseph Cirincione of the Ploughshares Fund commented in a recent article. And that brings us back to Erin Placey. “Allow your resolve to be strengthened by theirs and use your remaining time in office to get us back on the path toward a nuclear free world,” Erin advises. This article was first published in the Concord Monitor on November 27, 2016. The 2016 National Defense Authorization Act, passed by Congress and recently signed by President Obama, includes in its 1,320 pages plans for an entire new generation of U.S. nuclear weapons. It’s a big – and expensive – step in the wrong direction. The NDAA establishes policy and spending guidelines for actual appropriations. It calls explicitly for the United States to redesign our nuclear weapons and “modernize or replace” the submarines, missiles, and bombers designed to deliver them to targets all over the world. The price tag for the whole package is estimated to be in the vicinity of $1 trillion dollars over 3 decades. How such commitments get made, at a time when our president received the Nobel Peace Prize because he pledged to work for a world free of nuclear weapons, shows that what a previous President, Dwight Eisenhower, called the “military industrial complex” is as powerful as ever. Since 2010, individuals associated with the Virginia-based corporation have contributed $4.6 million to 224 members of Congress who sit on key committees, such as Armed Services and Appropriations. The company has laid out another $85 million for a troop of 100 lobbyists, among them five former members of Congress. Another program would design and build a new submarine, generally known as the “Ohio-class replacement,” or SSBN(x). The Navy wants 12 of them, at a cost estimated at $100 billion. Each sub will be able to launch 16 missiles, each missile with up to 8 independently targetable nuclear warheads, each warhead ranging from 100 kilotons (or nearly 8 times the size of the bomb that demolished Hiroshima) to 475 kilotons (more than 36 times the size of the Hiroshima bomb). In other words, we are talking about a range of 12,000 to 55,000 Hiroshimas. Unsure where they would get the money for this nuclear overkill capacity, Navy officials hatched an idea called the “National Sea-Based Deterrence Fund,” a budget gimmick which enables the Defense Department to shift money from other accounts into the submarine construction budget. The plan had an ally in a key position to help. Congressman Forbes’ district, in southeastern Virginia, sits next to the Norfolk Naval Station, the Norfolk Naval Shipyard, and Huntington Ingalls’ shipyard in Newport News. OpenSecrets.org lists “Miscellaneous Defense” and “Defense Aerospace” as the two business sectors most devoted to his election campaigns. Among Forbes’ most faithful donors over his 13-year Congressional career are shipbuilders Huntington Ingalls and General Dynamics, as well as Lockheed Martin, which builds the Trident missiles (at a cost of $37 million each). Other Forbes backers include Leidos, Honeywell, Northrup Grumman, and BAE. In addition to the new bomber and new submarines, the NDAA also includes funds for new missiles and “modernized” nuclear warheads to be built by companies including Lockheed Martin, Boeing, and others, all with PACs and teams of lobbyists working hard to win access to the taxpayers’ money. There is no presidential power more awesome than authority over the nation’s arsenal of nuclear weapons. For the chief executive, there is no responsibility greater than the need to prevent global nuclear holocaust. Yet the topic rarely comes up on the presidential campaign trail. 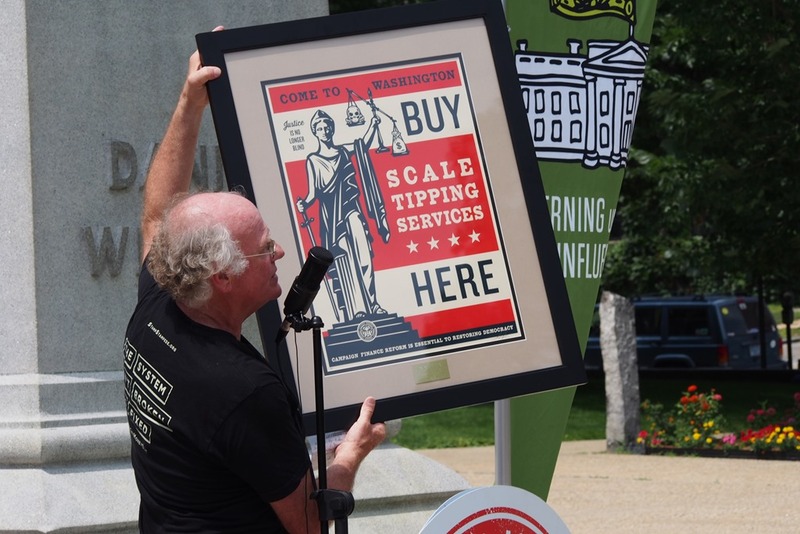 Stamp Stampede, an organization founded by Ben Cohen of Ben and Jerry’s, held a rally at the State House in Concord on July 30 to bolster efforts to "stamp money out of politics." I was one of the speakers. The following is based on my prepared remarks. Click here for a video of what I actually said. Pentagon contractors invested $27 million in candidates for Congress in the 2012 election cycle. Just the top ten Pentagon contractors spent $23 Million on politics. For that they received $202 billion in contracts last year. Not a bad return on investment. They hold job fairs for retiring generals and admirals looking for lucrative careers selling weapons back to their former colleagues. They sponsor trade groups, such as the Aerospace Industries Association, the Aircraft Carrier Industrial Base Coalition, the Submarine Industrial Base Council, the Association for Unmanned Vehicle Systems (the trade group for drone makers), the Shipbuilders Council of America, the Surface Navy Association, the Armed Forces Communications and Electronics Association, and more. They sponsor the media, for example Politico’s “Morning Defense” newsletter, brought to me each day by Northrup Grumman. They even donate to the pet charitable projects of spouses of members of the Congressional armed service committees. This is a classic case of what we call “governing under the influence,” or GUI. They are all practicing GUI to corrupt the political process and serve private interest at the public’s expense. If DUI is a hazard to the people on our roads and sidewalks, GUI is a hazard to democracy. If DUI needs to be approached as a public health problem of great importance, GUI needs to be seen as a political health problem of the greatest importance. But while DUI is a crime, GUI is entirely legal. And it’s gotten more legal due to the Citizens United and McCutcheon decisions which further opened the gates for floods of cash to flow into the political system from billionaires a nd corporations. The mega-rich are getting mega- richer. The giga-rich are getting giga-richer. And it is easy for them to recycle their wealth into the political system to generate policies that generate more wealth for themselves, leading to higher inequality, less democracy. Eisenhower said only “an alert and knowledgeable citizenry can compel the proper meshing” of industrial might with democracy’s needs. Government being instituted for the common benefit, protection, and security, of the whole community, and not for the private interest or emolument of any one man, family, or class of men; therefore, whenever the ends of government are perverted, and public liberty manifestly endangered, and all other means of redress are ineffectual, the people may, and of right ought to reform the old, or establish a new government. We say people power can be stronger than corporate power and we say today we have not yet exhausted all other means of redress. We are calling on the candidates to tell us what they will do to end the GUI system. What will they do to make sure the corporations that profit from building weapons of mass destruction are not determining our foreign policy? What will they do to make sure corporations that own and manage prisons are not running our immigration and corrections policies? What will they do to make sure our police departments don’t become just another profit center for the military industrial complex? What will they do to make sure our political system is based on the principle of one person one vote, not the principle of one dollar one vote? So far we have trained more than 500 people in NH and a couple hundred more in Iowa. The GUI project is putting the candidates on the spot and documenting their responses. The GUI system is strong, but not invulnerable. It has a crack that opens in NH and Iowa. We have a little over six months to make sure the candidates hear from us. Stamp money out of politics. I wrote this for the Governing Under the Influence blog. 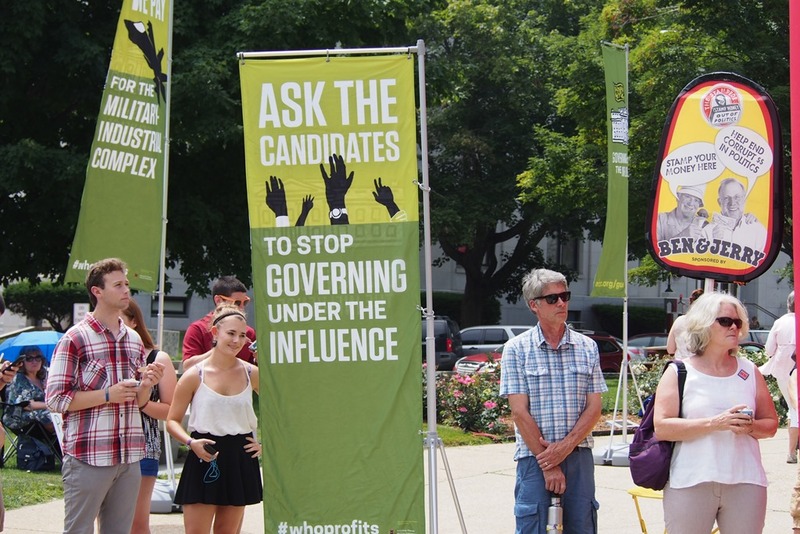 In 1776, the signers of the Declaration of Independence stated that government derives its “just powers from the consent of the governed.” But in these days of rising escalating economic inequality, unlimited campaign spending, and a multibillion-dollar lobbying industry mostly devoted to corporate interests, the consent of the governed often seems irrelevant in the corridors of power. 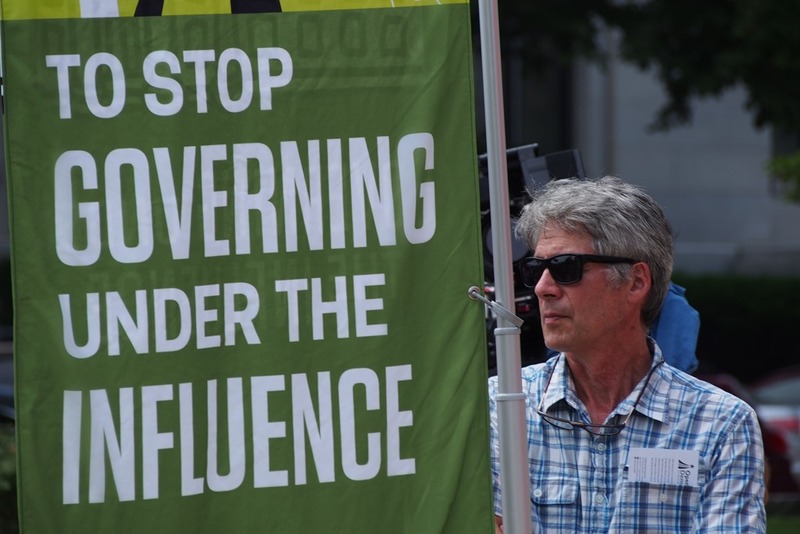 "Governing under the Influence" or “GUI.” That’s what we call the interconnected web of campaign spending, lobbying, and revolving doors between Capitol Hill, lobbying firms, think tanks, and the Pentagon that feed private interests at the expense of public good. Governing under the Influence can be seen at work in how public officials spend our taxpayer dollars. Let’s look at U.S. military spending, for example. Since President Eisenhower coined the phrase, the “military-industrial complex” has grown to include outsourcing of government surveillance, transforming the U.S.-Mexico border into a war zone, converting police into paramilitary forces, and turning over the military’s own core functions to private contractors. Lockheed Martin is a prime example of corporate influence on public policy. The corporation is the Pentagon’s top contractor. It spends over $14 million a year on lobbying, and its employee PAC (political action committee) raises another $4 million for campaign contributions. Lockheed’s 71 registered lobbyists include a former US Senator and 2 former US Representatives, one of whom chaired the committee which oversees the DOE’s nuclear weapons budget. Norman Augustine, the corporation’s former CEO, is now co-chair of a government panel on nuclear weapons that has called for relaxed oversight of weapons labs and more lucrative contracts for private companies, such as Lockheed, that run them. (See “Nuclear Weapons Complex: Foxes Guard Chickens.”) The current CEO, Marillyn Hewson, sits on the International Advisory Board of The Atlantic Council, a think tank with close ties to the military and foreign policy elite. This may be business as usual in Washington, and sometimes it’s easier to shrug our shoulders and give in to the thinking that this system will never change. But something is bubbling up in Iowa and New Hampshire, where the first contests for the 2016 presidential nominations will take place. There, the Governing Under the Influence (GUI) project is reminding candidates that the interests of the people must come first. With seven months to go before the Iowa caucuses, we’ve already trained more than 500 volunteers to “bird dog” candidates about the excessive corporate influence that drives our country toward more wars, more prisons, and more violence. Our team of volunteers is at town halls, fairgrounds, living rooms, TV studios, city sidewalks—anywhere candidates appear—to ensure these issues get the attention they deserve. The GUI project isn’t partisan; it’s not about ranking the candidates or telling anyone how they should vote. It’s about shifting the political discourse by exposing forces that steer us in the wrong direction. And we’ve already seen results, drawing out responses from close to 20 candidates and garnering attention from media outlets like the Boston Globe, Fox News, and Huffington Post. 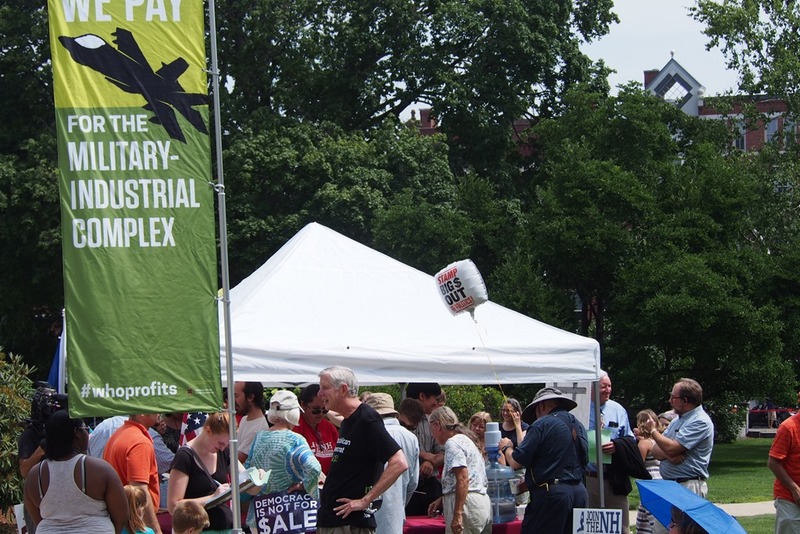 This Fourth of July, join us in declaring independence from corporate rule. If “just powers” come from the consent of the governed, the GUI project may be just the thing to bring about change. The Concord Snowshoe Club, a rustic and out-of-the-way venue in New Hampshire’s capital city, was the site of a kick-off event for Senator Lindsey Graham’s possible presidential campaign on Sunday afternoon, March 8. Hosted by the City Republicans, the “Politics and Pies” event was free, open to GOP members and unaffiliated voters, and open as well to the press. Senator Graham arrived on time, took a position by the fireplace, gave a short speech about his priorities, and responded to questions for more than an hour. Graham is an aggressively hawkish critic of President Obama’s foreign and military policy, but at the same time takes a perspective on domestic issues that tends toward the pragmatic rather than the ideological. Immigration is an example. 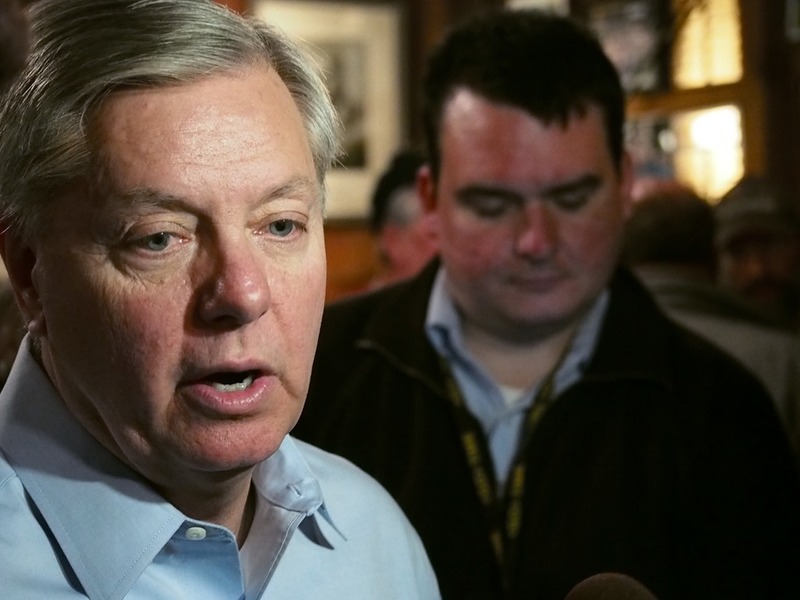 Graham was among the 14 Republicans who voted with the Senate majority for a complex immigration reform bill in 2013. Had it passed the House, the bill would have increased funds for “border security” (i.e. more police, soldiers, weapons, and fences for the US-Mexican border) and created a tortuous path that would have enabled many of the country’s 11 million undocumented residents to gain legal status and qualify eventually for citizenship. Graham described it as a “rational and practical” approach to immigration. In the Q&A session, I asked Senator Graham about the budget provision which mandates that federal authorities have 34,000 immigrants in detention on any given day. “The big beneficiaries of this seem to be the private prison companies, the for-profit companies, which is where about half of the immigrants are housed. And of course they turn around the profits and lobby for more prisons and immigration policies that benefit them,” I said, asking how we can get to a rational policy in the face of such realities. Without discussing the detention bed mandate, Senator Graham launched into an explanation of the need for immigration reform, starting with the fact that the reason so many immigrants are coming here is to work and that the country has a long-term labor shortage. The Senator also believes GOP support for immigration reform will help the party woo Hispanic voters. “Here’s what we’re going to lose in democracy if we don’t have control over the money. The most influential people in the country will be the ones with the most money, and the ads you see on TV ad nauseum, you don’t know where they’re coming from, you don’t know who’s responsible for them.” Graham said he would support a constitutional amendment as long as it applies to union funds as well as funds from corporations. Then he joked he wouldn’t walk as far as Granny D did. Senator Graham has launched a political committee, Security Through Strength, to help him “’test the waters’ for a potential 2016 run for president.” We can look forward to picking up where this discussion left off next time he’s in town. 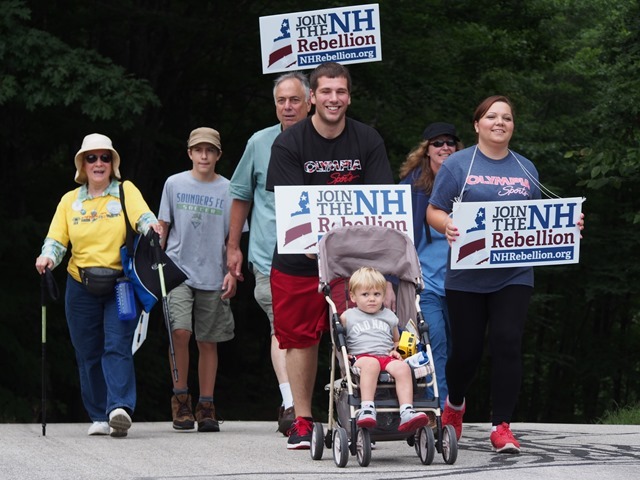 A quiet country road from Dublin to Hancock, New Hampshire was the site of the New Hampshire Rebellion’s latest “Granny D Walk” to end the influence of money in American politics. 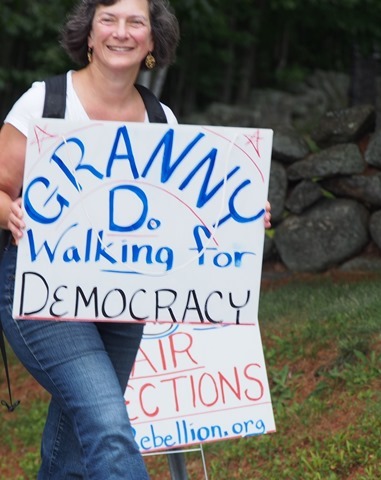 Granny D was the public moniker for Doris Haddock, a long-time Dublin resident who set out from California a few days short of her 89th birthday to walk across the USA and publicize the need for campaign finance reform. She had just turned 90 when she reached the nation’s capital on February 29, 2000. The path of today’s walk was one she used to train for her historic pilgrimage, which ended at the US Capitol on February 29, 2000, a month after she turned 90. January and another along the New Hampshire seacoast in July. Today forty people, aiming to make breaking the money-politics link a central issue of the 2016 presidential nominating contest, continued Granny D’s quest. Walking through a wooded area with no pedestrians and barely any cars, there weren’t many people to educate and convince. But perhaps that wasn’t the point. There’s a long history of walks, marches, and pilgrimages intended to bolster movements for social change. Gandhi’s march to the sea, the 1965 march from Selma to Montgomery, the United Farm Workers Union’s 300-mile march from Delano to Sacramento, and the regular peace walks led by the Nipponzan Myohoji monks come to mind as examples. Yes, they are expressions of political views, but they also embody spiritual power. When we sing “we won’t let nobody turn us around,” we aim to capture that same spirit. 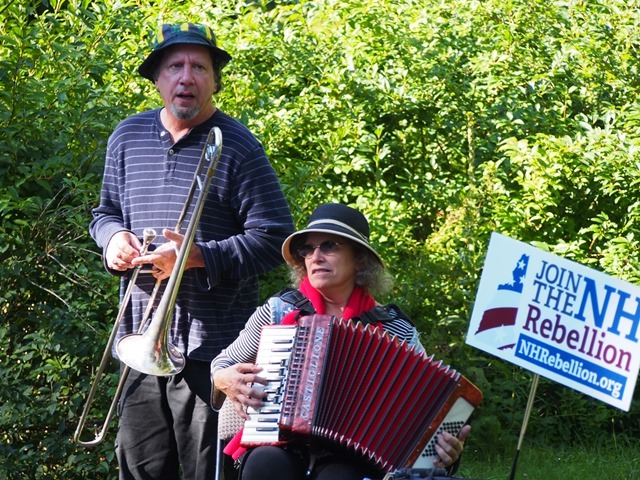 When musicians Leslie Vogel and Fred Simmons treated us to “Just a Walk with Granny D” before the march, I felt the spirit in motion. Part of the point was also to get to know new people, Dan Weeks said at the walk’s outset. 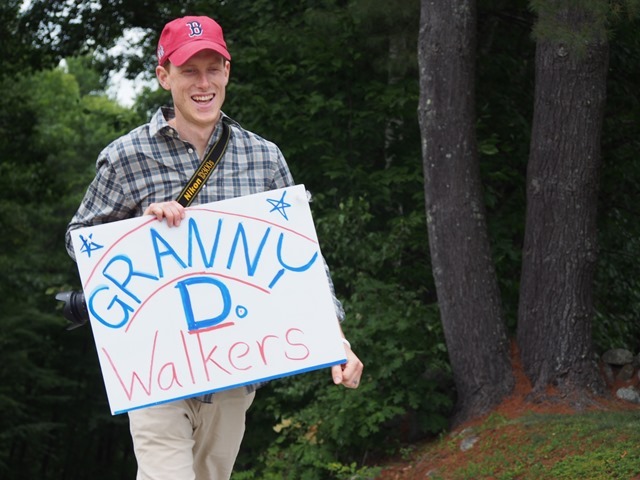 Dan, who was recently appointed as Executive Director for the NH Coalition for Open Democracy (NH COD), says his own activist inclinations began when Granny D visited his high school. At that time the impressionable 15-year old learned from his elderly neighbor that companies which profited from selling tobacco had a heavy hand in writing the nation’s laws through their political involvement. Children were dying because of the nation’s twisted approach to campaign finance, Granny D explained. Dan was hooked, not on cigarettes, but on money & politics activism. “The system excludes so many of our people,” he says. To put it another way, if money is speech, then those with the most money get the most speech. And as the distribution of wealth becomes increasingly skewed, inequality of speech becomes a profound political problem for a country where government of the people, by the people, and for the people is supposed to be imperishable. From Dan’s perspective, a walk in the steps of Granny D is a statement that we have not given up hope. Two hours after setting out, clusters of walkers arrived in the center of Hancock, a town with a population of fewer than 2000 people. There we were greeted by volunteers and treated to ice cream donated by Ben & Jerry’s. The crowd had grown to about 60 people, now including Jim Rubens, a Republican candidate for the US Senate who has made campaign finance reform a plank in his platform (and who says he’s the only Republican in the race who is speaking out against the third Iraq war). 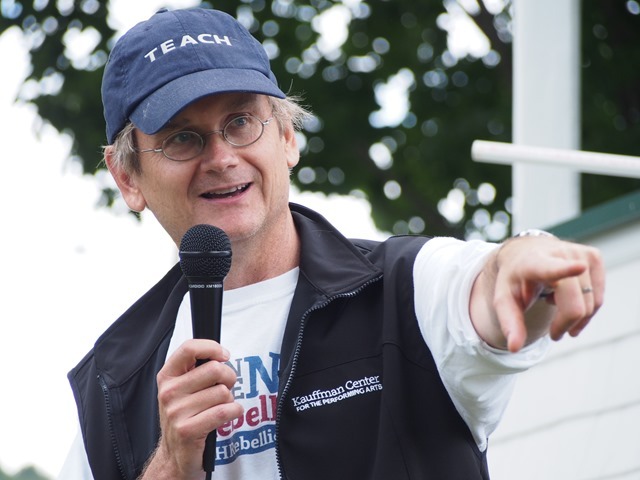 When the ice cream had been eaten, Dan Weeks introduced Professor Lessig for a short speech by the gazebo on the Hancock Common. 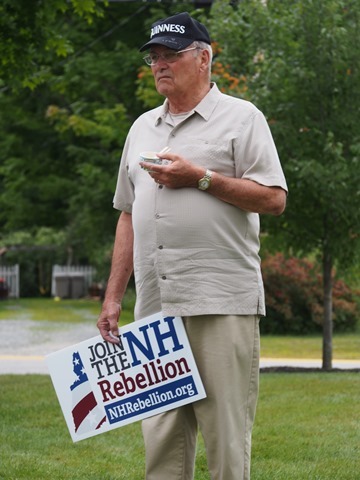 Lessig apparently didn’t feel a need to educate the assembled dozens about the corruption caused by the billions of dollars in the political system, nor did he choose to restate the strategy of the NH Rebellion. He chose instead to exhort the small crowd about the importance of action, something he says our country has become unaccustomed to taking. 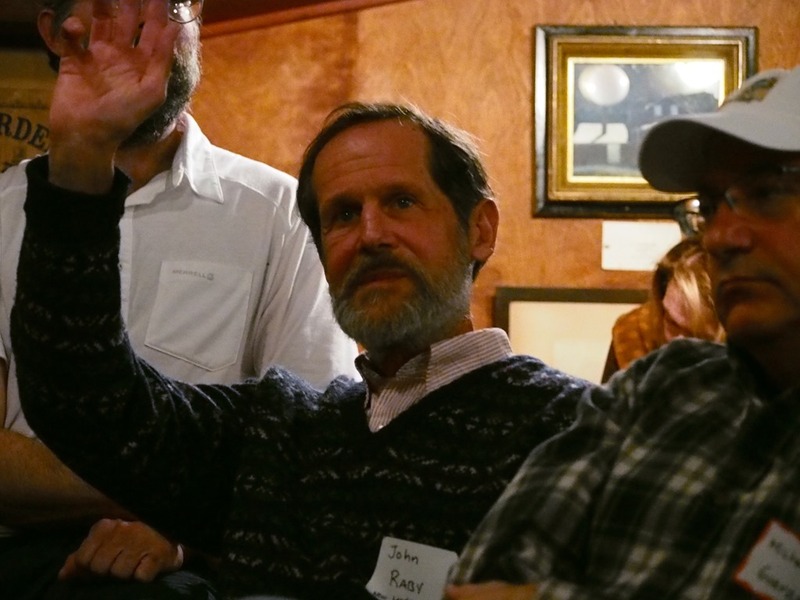 “We’ve just gotten through a century of very passive politics, where we were told to shut up and listen to the commercials and just show up to vote,” Lessig said. Plans are already being hatched for another walk next January, timed to coincide not only with Granny D’s birthday but also with the fifth anniversary of the Citizens United court decision.